The global biotech flavors market has significantly gained impetus due to increasing awareness among consumers, particularly in the developed countries owing to negative impact caused by the artificially produced food flavors on human health. Increasing health conscious population all across the world has augmented the growth of the global biotech flavors market, as there is significant shift in preference from artificial to natural flavors. Rising awareness regarding the benefitted associated to the biotech flavors market is favoring the market to grow. These days it has been noticed that the consumer are more aware regarding the nutritional values of vegetables and fruits Apart from these benefits of increasing antioxidant levels, accompanied with reduced risks of metabolic diseases. Rising cases of obesity and diabetes across the world has stimulated the consumer all across the world to give away junk foods and uptake biotech flavors. These factors have increased the sales of the product. Biotech process which mainly consists of microbial fermentation, tissue culture, bio-conversion and plat tissue, enable to convert vegetables and fruits ingredients to desired flavors without impacting the nutritional value. These had made the global consumers to prefer biotech flavors. The global biotech flavors market is anticipated to expand at 9.7% of CAGR between the forecast periods 2016-2024. The market is likely to be worth at US$991.0 mn by the end of the assessed period. In terms of volume, it is prognosticated the market to touch 23980.3 tons during the above mentioned period. The global biotech market has various types of flavors which lures the customers such as fruity, vanilla and vanillin, and other flavors. It has been noticed that fruit and vanilla and vanillin flavors are most asked for in the market. It is anticipated that the demand for fruit flavors is going to rise further owing to the high demand for processed food and beverage around the world. Demand for biotech flavors market is seen majorly from dairy products, bakery products, nutraceuticals, non-dairy ice cream, beverages, and confectionary products. Amongst these, it has been duly noted that the use for biotech flavors is majorly used for beverages. Demand for flavored beverages has favored the area to grow. The global biotech flavors market is stretched across Middle East and Africa, Asia pacific, Europe, Latin America, and North America. Amongst the pack, North America holds the major share owing to considerable awareness among consumers regarding the advantages associated to the biotech flavors. Recently, Europe held a considerate amount of share in the market, but researchers expects that North America will retain its position in years to come. On the other side, Asia Pacific is expecting to witness a surge in its demand due to high demand for biotech flavors from the emerging countries in the region such as India and China. The wellness and health trend is likely to be seen in the region which is likely to provide extra boost the growth of the market in the region. Manufacturers are focusing on innovating new flavors for beverages as they are of high demand in the region. This is likely to satisfy the rising demand in the region. Transparency Market Research (TMR) offers an eight-year forecast for the global biotech flavors market between 2016 and 2024. The main objective of the report is to offer insights on the advancements in the biotech flavors market. The study demonstrates market dynamics that are expected to influence the current environment and future status of the global biotech flavors market over the forecast period. The report aims to offer updates on trends, drivers, restraints, value forecasts, and opportunities for manufacturers operating in the global biotech flavors market. Rising health consciousness among consumers has resulted into increased preference for natural ingredients among consumers worldwide. High consumer awareness regarding the nutritional benefits of biotech flavors is expected to contribute significantly to the revenue growth of biotech flavors market. Additionally, biotech processes such as plant tissue culture, microbial fermentation, and bio-conversion enable conversion of fruits and vegetable ingredients into flavors without having any adverse impact on its nutritional value, and thus can be considered relatively more natural than chemically synthesized flavors. A section of the report discusses how the overall competition in the market is steadily increasing. It discusses various factors shaping the internal as well as external competition in the market. Overall internal competition in the biotech flavors market is observed to be comparatively high owing to a large number of major providers of biotech flavors and increasing number of small domestic players in the market. The global biotech flavors market is facing external competition from producers & distributors of raw material and other food processors, who are adopting forward and backward integration strategies, and developing their own facilities to produce biotech flavors. Various barriers to entry in the industry are analyzed and rated on the basis of their impact on the competition level in the market. In addition, it is imperative to note that in an ever-fluctuating global economy, we not only conduct forecasts in terms of CAGR, but also analyze on the basis of key parameters such as Year-on-Year (Y-o-Y) growth, to understand the predictability of the market and identify the right opportunities. Another key feature of this report is the analysis of all key segments in terms of absolute dollar. This is usually overlooked while forecasting the market. However, absolute dollar opportunity is critical in assessing the level of opportunity that a provider can look to achieve, as well as to identify potential resources from a sales and delivery perspective in the global biotech flavors market. The report analyzes the global biotech flavor market on the basis of the flavor, form, and the application area of these flavors. It also provides a market outlook for 2016–2024 and sets the forecast within the context of the biotech flavor ecosystem, including strategic developments, latest regulations, and new product offerings in the global biotech flavor market. On the basis of flavor, the global biotech flavor market is segmented into vanilla and vanillin, fruity flavor, and others. Vanilla and vanillin is expected to be the leading segment in the global biotech flavors market during the forecast period. On the basis of nature, the global biotech flavor market is segmented into liquid, powder, and paste. Powder form is expected to be the leading segment in the global biotech flavors market during the forecast period. On the basis of applications, the global biotech flavors market is segmented into dairy products, beverages, confectionery products, non-dairy ice cream, bakery products, nutraceuticals, and others. Beverages expected to contribute significantly to the revenue growth of the global biotech flavor market. The study further discusses key region trends contributing to growth of the global biotech flavor market, as well as analyzes the degree to which drivers are influencing the market in each region. Key regions assessed in this report include North America, Latin America, Europe, Asia Pacific, and the Middle East and Africa (MEA). In the final section of the report, a competitive landscape has been included to provide report audiences with a dashboard view. Key categories of providers covered in the report are biotech flavor suppliers, manufacturers, and a list of major retailers. Detailed profiles of the providers are also included in the scope of the report to evaluate their long- and short-term strategies, key offerings, and recent developments in the biotech flavors market. 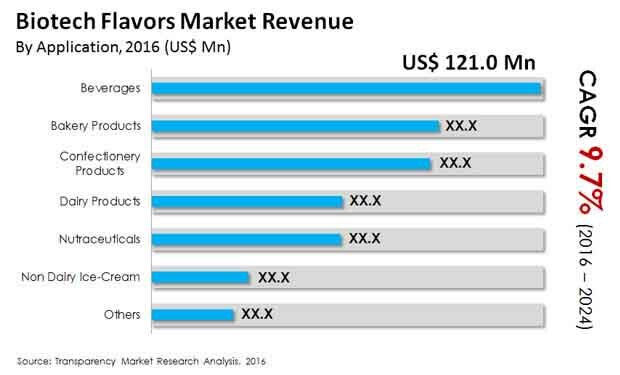 Key players in the global biotech flavor market report include Givaudan, Sensient Technologies Corporation, Bell Flavors and Fragrances, Symrise AG, International Flavors & Fragrances, Inc., Takasago International Corporation, Frutarom Industries Ltd., Naturex group, Firmenich S.A., and Kerry Group Plc.